Julius Caesar walks into the immense dinning area of his palace, after a long morning of executing the criminally accused citizens of Rome. After washing his hands over a golden dish filled with sitting water, the Emperor sits and impatiently demands his first meal of the day. Two servants dash out of the meal preparation area each holding a platter of food. As the servants approach the table, the emperor is overwhelmed by a sweet aroma venting from the platters. Finally meal time has arrived and the emperor is puzzled at this new smell. Although he has never tasted or seen this new food he quickly stuffs it in his mouth and rigorously chews. The servant, who was from an area of the Roman Empire known as Gaulle, later named France, was new to the empires kitchen staff. The servant’s recipe was his own. The recipe consisted of wheat bread that had gone bad, after 3 weeks of not being eaten. The servant created a mixture of eggs, exotic spices, and a rare ingredient at the time known as milk. He dipped the stale bread into the mixture and immediately set the bread over the fire. When the bread’s inside became warm and soft the outer layer stayed crispy. After a few moments baking in the fire, the toast would be ready to eat. Thus creating the first form of French toast. A few centuries later, a more delicate version of the French Toast was created in Britain. The British version originated from France where its citizens would prepare the food the same way it was so many years earlier except with a touch of sweet sugar, honey and fresh fruit toppings. The recipe for this interesting toast was brought to the Americas with explorers and settlers. To this day the dish has taken on many forms in the United States served with a variety of toppings. The most delicious recipe in its finest hour can be found at a French bakery in Miami Florida, Atelier Monnier. In this kitchen French chefs have perfected the dish. Travelers from around the world visit every day to taste the traditional French recipe. 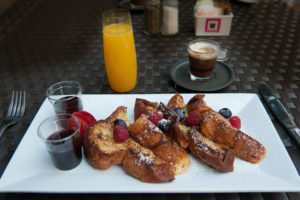 Our bakery carries a vast variety of French pastries, sweets, and savory cuisine all in the traditional French form each with their own rich history, but if you’ve had a long morning and are looking for something to satisfy the most dynamic of taste the French Toast will defiantly “hit the spot”. Follow Atelier Monnier on our social media and stay up-to-date on our special offers and delicious cuisine.